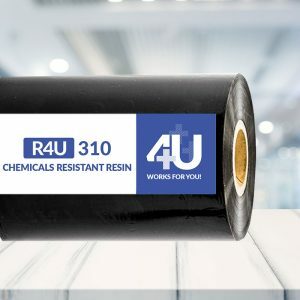 +R4U Resin thermal transfer ribbons developed for applications requiring excellent mechanical and solvent resistance. It is suited to most synthetic materials such as PVC, PET, PP and various matt and gloss coated papers. Full resin thermal transfer printer ribbons are made of pure resin. Are you looking for a ribbon for extreme environmental labeling? These resin barcode ribbons melt at a much higher temperature, dissolving into the material on which they’re printed, resulting in extreme durability and chemical resistance! +R4U 300 Premium Resin barcode ribbon provides the most durable, chemical resistant, clear image possible when used on the proper labels. +R4U 310 Chemicals Resistant Resin barcode ribbon feature high chemical, scratch and abrasion resistance while offering exceptional print quality. This thermal transfer resin ribbon gives extreme performance on polyester and other plastic labels. +R4U 330 Super Premium Resin barcode ribbon produces long-lasting, dense bar codes and images, and is the high performance resin ribbon solution for applications that require superior resistance to heat, abrasion and chemicals. 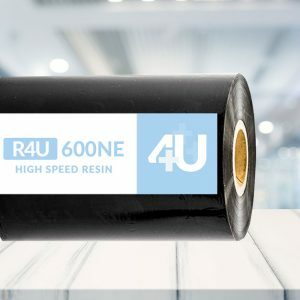 +R4U 600NE High Speed Resin offers a superior performance for creating crisp, clean, sharp-looking barcodes for a wider variety of substrate materials. +R4U 620NE High Speed Resin near edge barcode ribbon is specifically designed for next-generation thermal transfer printing.